Add a Little Comfort to Your Camping! 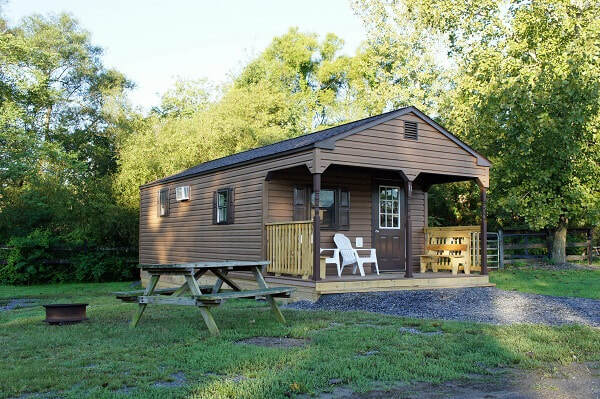 Each charming cabin comes with air conditioning, an outdoor fire ring, a picnic table and porch seating. Cabins are within walking distance on our grounds. Please note you are responsible for bringing your own towels and linens. Four-person cabins nestled along the tree line by our fishing pond. Recently upgraded with new kitchen and restroom with shower. Includes a double bed and a set of bunk beds. Our themed School House and Jail are four-person primitive cabins. Located behind are box stalls and corrals for you to board your horse. Bunk rooms only with double beds and a set of bunk beds. 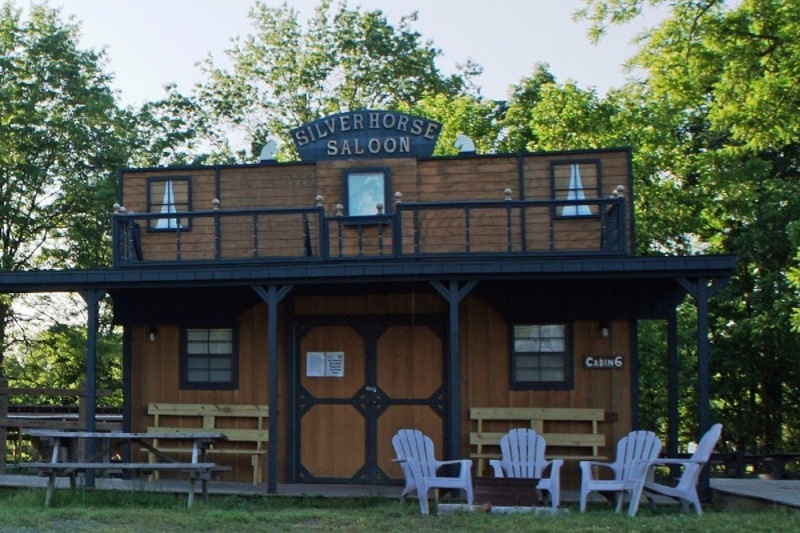 Our themed Silver Horse Saloon is a six-person primitive cabin. Includes a double bed and two sets of bunks. Located behind are box stalls and corrals for our horse boarders. Our themed General Store & Gun Shop and Harness & Saddle Shop. Six-person primitive cabins a double bed and two sets of bunk beds. Located by our Fort Frederick Douglass Pavilion and horse stabling area. Six-person cabin with base board heat, kitchenette, restroom & shower. Includes a queen size bed in a private room as well as two sets of bunks. Base board heat, air conditioning, kitchenette, restroom & shower. Includes a double bed, a bunk room with one set of bunks and a loft. Offers an adjacent horse corral for our horse campers. Sleeps six with with queen bed in a private room and two sets of bunks. Facilities such as our pavilion, air-conditioned movie room, serving facility, Fort Frederick Douglass and riding arenas are available for camper and public use. Please call the camp office at (717) 334-1288 for facilities rental & reservation information.